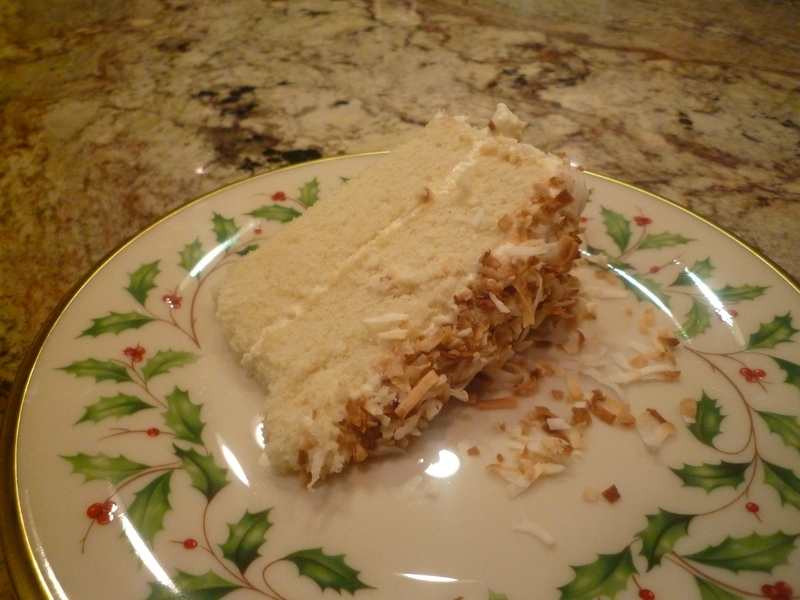 Over the summer, I discovered my future mother-in-law’s love for coconut cake. Her only complaint was that half the time you order it somewhere, it turns out to be a plain white cake covered with tooth-achingly sweet seven-minute frosting and bland shredded coconut. The coconut flavor just isn’t there. Right then, I knew exactly what I’d make for her birthday this year. Many coconut cake devotees insist that the only way to achieve real coconut taste is to use a fresh one, but I couldn’t find one anywhere in Northern Virginia. I’d even charged the power drill, but it wasn’t to be. After some research I discovered other ways of injecting some true coconut flavor into the cake, and I have to say that I think it turned out even better because of how the ingredients created a soft, tender cake and rich icing with just the right amount of sweetness. It was a big hit among the family and I think honestly, one of the best cakes I’ve ever made. 2 cups shredded coconut, half sweetened, half unsweetened, toasted until golden in a 350 degree F oven for 3-5 minutes. Coat 2 (9-inch) round cake pans with butter and dust with flour. Whisk together 2 1/4 cups sifted flour, baking powder, and salt, and set aside. Place sugar and butter in a large bowl; cream at medium speed until well blended (about 5 minutes). Add eggs, 1 at a time, beating well after each addition. Add flour mixture and coconut milk alternately to the wet ingredients, beginning and ending with flour mixture. Stir in extracts. Pour batter into prepared pans. Sharply tap the pans once on countertop to remove air bubbles. Bake at 350° for 30 minutes or until a wooden pick inserted in the center comes out clean. Cool in pans 10 minutes on wire racks, and then remove from pans. Cool completely on wire rack. Wrap cooled cakes tightly in plastic wrap and refrigerate overnight. Prepare the icing by beating the cream cheese and softened butter together on medium speed until fluffy and smooth. Then, switch to a whisk and slowly add the powdered sugar and cream of coconut and whisk until smooth. Cover the bowl of icing and refrigerate until use. To assemble the cake, unwrap one layer and cover it with a layer of frosting. Add the next layer and frost the entire cake lightly and return it to the refrigerator. 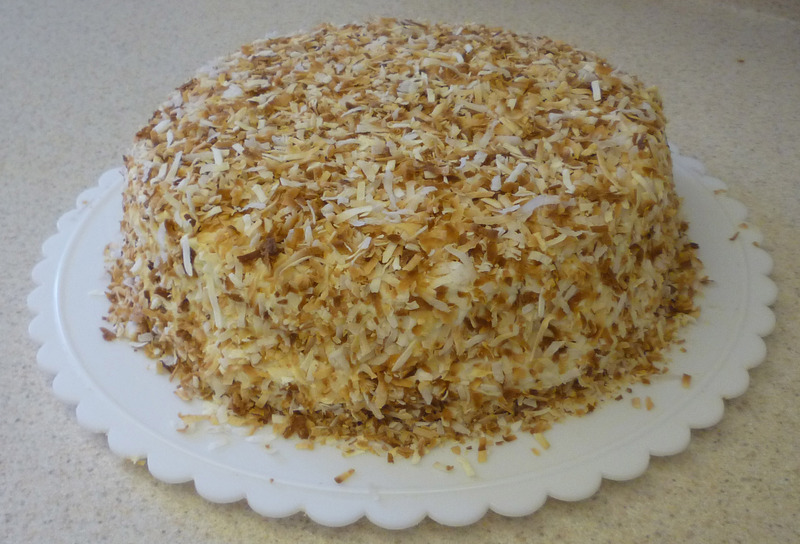 Once the icing has set up slightly, apply a final, smooth coat of icing and finish with the toasted, shredded coconut.